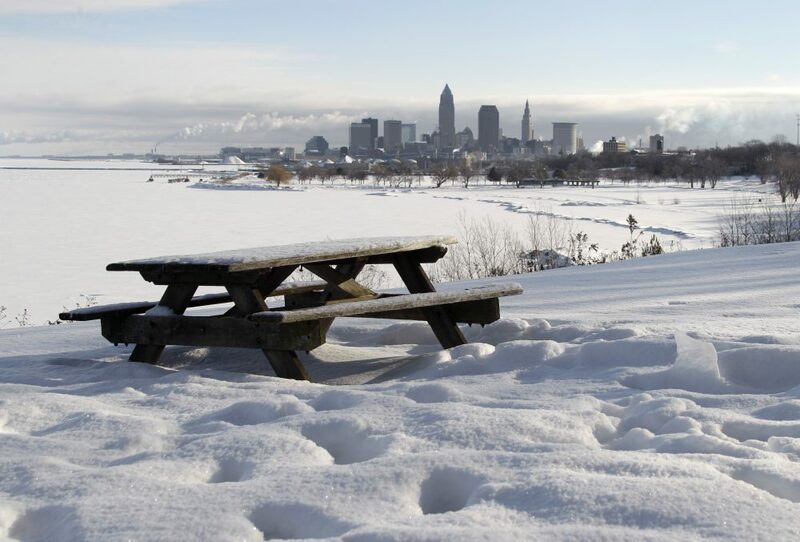 Snow surrounds a lone picnic table at Cleveland Lakefront State Park, Feb. 8, 2011. Photo by Mark Duncan/Associated Press. Zócalo Public Square’s daily ideas journalism and free public events aim to shed light on critical issues that explore our shared human condition and ask questions about how we navigate the world we’ve made. We publish a new poem each Friday in the same spirit, and for the last six years, it’s why we’ve awarded a prize to the poem that best evokes a connection to place. This year, 417 poets submitted a total of 979 poems, transporting us to the San Gabriel Valley, the Blue Ridge, and the Salton Sea to granite mountain ranges near Yosemite, Mexican deserts, and unnamed cities of the mind. Ultimately, Zócalo poetry editor Colette LaBouff and the editorial staff chose to honor a poem that takes us on a journey, mediated by memory and technology, to an Ohio urban winter-scape from which events ripple out to touch people living many miles away. 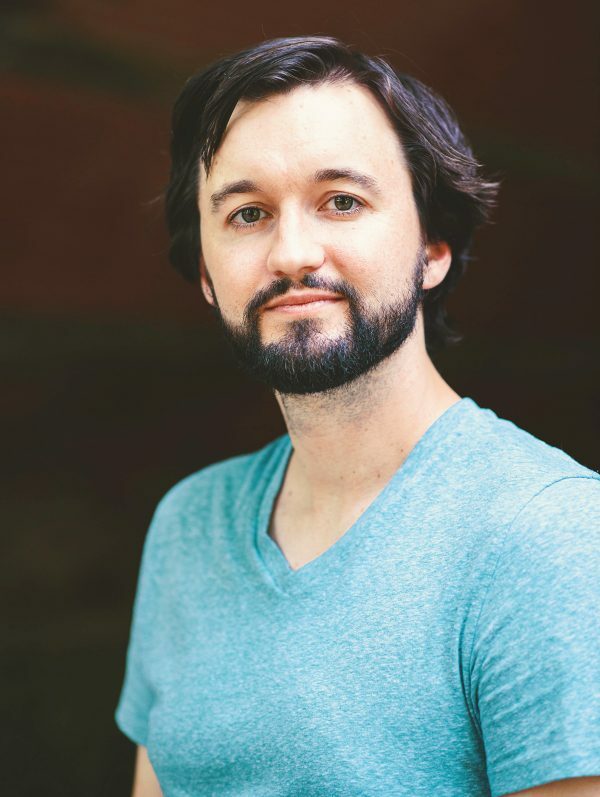 We’re thrilled to award the $500 Zócalo Public Square Poetry Prize to Matt Sumpter, a native Ohioan who now makes his home in New York City with his wife and young daughter. But he told us he still considers himself a Midwesterner “by sentiment and heart as well as birth.” Sumpter also lived in Missouri, Montana, and Oregon while working as an AmeriCorps service member, and earned a masters of fine arts at Ohio State University and a Ph.D. in Creative Writing at SUNY Binghamton, before relocating to Manhattan’s Morningside Heights neighborhood. shying from anything human skin has touched. hanging from the handlebars like streamers. whistling to the cats every couple passes. as a police car runs into the grass. of soup, forgetting to wipe their shoes. where every poem finally says I’m here with you. trying to believe there is no word for exile. We spoke by phone with Sumpter about the inspiration for ‘No World’ and about why he became a poet. Q: The speaker in your poem makes several references to Ohio, but seems to be physically somewhere else. A: I grew up in Cincinnati, but I wrote this in Binghamton, in upstate New York. It was the middle of winter and there was like a foot of snow on the ground, when the sun is just this kind of urban legend that people vaguely refer to. So mood-wise, that’s a time for some sad nostalgia, maybe, or some reminiscence about other places and other times that are also a little lonely. Q: The poem speaks about the idea of different, self-contained worlds. There’s the self-enclosed world of the television; the world of the TV cam; the world of Ohio; the world of wherever the poem’s speaker is; the world of winter, both as a landscape and as a state of mind; the world of possibility vs. the world of what actually happens; and the world of words—the world of the poem itself. What’s missing from this list? A: You could include the Shakespearean world that’s mentioned in the poem, if you wanted to, I suppose. In the poem there’s basically two main scenes: There’s the neighbor, and there’s the lightly veiled recounting of the Tamir Rice shooting. And both of those incidents are worlds unto themselves, worlds that are perhaps more isolated from the speaker than some of the other worlds. Isolation is certainly a big theme within this poem. It’s not necessarily one that I set out to write about, but it’s certainly something that ended up being there by the time I was done with it. The things that the speaker is thinking about and interacting with are certainly more isolated conceptually, but at the same time, the speaker is reaching out to them and trying to make some connection with them. And that was something I wanted to keep in the poem, that within these moments of isolation there’s still this way in which they affect us and we can connect them, or they reach out and connect to us. We can’t really hide from them. The poem’s speaker is trying to navigate that boundary where he’s mediating between these worlds. Q: Then there’s the word that ends your poem, “exile.” Did you feel you were in a kind of exile from your native state when you wrote this poem? Q: How did you conceive the form of the poem? A: Usually I start writing about something, whether it be an image or a sound or a metaphor or an idea or a situation that really sticks with me. And I’ll just keep writing and rewording it, until the first line or two seems to resemble poetry I wouldn’t be embarrassed by! And then I extrapolate from there: Does the poem go on in this way, or is there a turn in the poem that tweaks the form in some way—does the form change? And if it changes, is it going to be continually changing? Is it going to enter this dynamic, flux-y state where it’s a looser-form poem? Or is it going to maintain the current form, and is the content going to move and shift and be fluid within that form? This poem is closer to being a formal structure, because it’s pretty consistent tercets. But tercets have more instability than most regular structures. I think it worked for this poem, because a sense of incompleteness and unevenness was something this poem was trying to evoke emotionally. Q: The poem frequently uses a short “a” sound—“cats,” “gas,” “cracks,” “plastic bags,” “passes,” “traffic jam.” These seemed to evoke the sound of cracking ice, or other sharp noises that can break through the muffled stillness of a snowy landscape. A: Absolutely. Those short “a’s” have an abrasive feel to them. I think maybe one, by itself, would be a sort of puncture. But in larger quantities there is an abrasive feel to them, where something is being worn away, or shaken, or a placidness is being disturbed. The poem is sonically poking or jabbing at the silence around it. Q: When did you start writing poetry, and why? A: Reading “The Love Song of J. Alfred Prufrock” in 11th grade really got me started. That was the first time that I was struck by poetry as being something that was immediate and felt. It reached out to me in some different way. And, I thought, No. 1, that’s really great, and No. 2, I would like to do that also! Zócalo has been awarding a poetry prize in conjunction with our annual book prize since 2012. Jody Zordrager won the inaugural prize for “Coming Back, It Comes Back,” a poem about returning home to Massachusetts. Our 2013 prize went to Jia-Rui Cook—prior to her joining the Zócalo staff as editor—for “Fault,” a poem about the shifting ground on which Southern Californians live. The 2014 prize went to Amy Glynn for “Shoreline,” about a place where we can sit back and watch the tide roll out and come in. Gillian Wegener won the 2015 prize for a poem that evoked the intimacy of a diner in a small town in the midst of change. And Matt Phillips won the 2016 prize for “Crossing Coronado Bridge,” which takes us on a journey across the span that connects the city of San Diego to Coronado Island, and explores our need to venture out into cold, black water—while recognizing there’s always a depth that is beyond our reach. Primary Editor: Reed Johnson. Secondary Editor: Sarah Rothbard.